The owner was given this object in London, approximately 10 years ago, by someone he afterwards had no contact with any longer. To him the object functions as a souvenir. It paradoxically turned into a hope object because of the hopeless situation within which it was received. 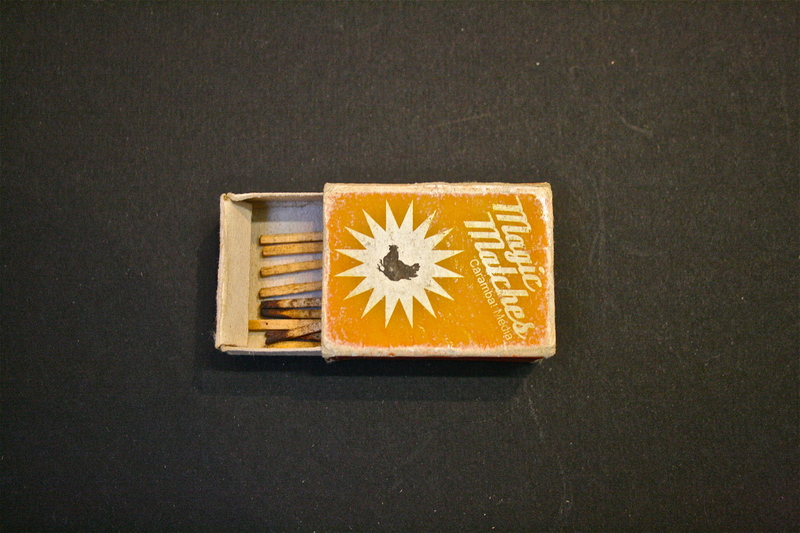 Very likely origining from The Czech Republic, the object is a small and quite worn out cardboard sleeve of 1,3 cm by 4,3 cm, clasping around a cardboard drawer of 1cm by 4 cm, containing 10 used matches. The thinner surfaces of the outer sleeve are covered with sparking paper. The larger surfaces are orange colored showing the symbol of a darkbrown chicken within a white spark/star, presenting 16 spikes. Additionally the front side shows a brand label “Magic Matches Carambal Media”, the backside carries a text in Czech language, which did not make any sense after the owner had applied the google translation tool to it.